Bib There are 10 products. 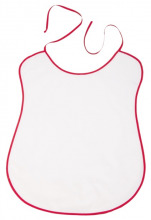 Bib spaghetti 100% cotton, 59x37 cm, drawing printed. Colours : white, red, yellow, green and grey. 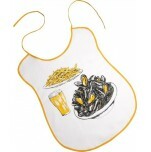 Bib mussels, French fries and beer, 100% cotton, 59x37 cm, drawing printed. Colours : white, yellow, black, and gray. 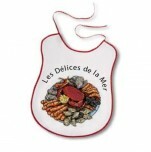 Bib 100% cotton, 59x37 cm, drawing a seafood plate printed with black printed "Les Délices de la Mer". Colours : white, red, gray, beige, blue, yellow and orange. 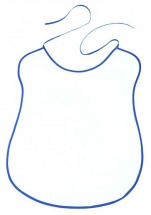 White bib with royal blue outline, 100% cotton, width 41 cm x height 57 cm. 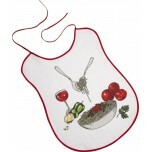 White bib with red outline, 100% cotton, width 41 cm x height 57 cm. 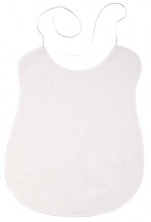 White bib with white outline, 100% cotton, width 41 cm x height 57 cm. 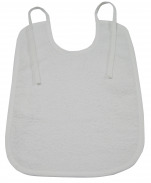 Bib 29x38 cm white 100% cotton terry, 280 gr/m². Ideal bib for embroidery through the short loop. 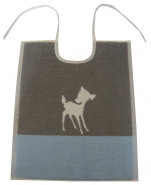 Bib ivory fawn, 100% cotton terry, 33x40 cm. Colors : pink and gray. Ivory collar and cords. Great model to properly protect your baby during his many meals. 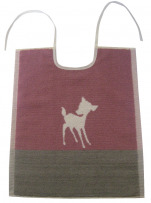 Bib ivory fawn, 100% cotton terry, 33x40 cm. Colors : blue and gray. Ivory collar and cords. Great model to properly protect your baby during his many meals. 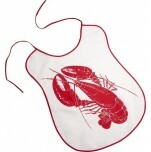 Bib 100% cotton, 59x37 cm, drawing a red lobster printed. Colours : white and red.